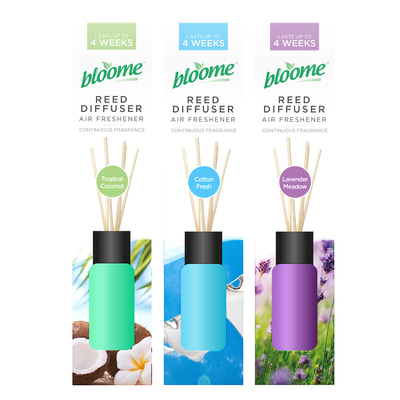 Scent any room at your work or home with these Fragranced Reed Diffusers. Lasting up to 4 months, each one features a bunch of rattan reeds that sit within a pool of aromatic oils. Each reed slowly absorbs the scent and moisture given off by these rich oils and releases it naturally into the room - spreading easily to fill the largest of spaces. With everything from floral lavender, crisp fresh linen or tropical coconut, they offer a more eco-friendly option to harsh room sprays and are ideal for anyone dealing with breathing issues. Stand these reed diffusers around the room and allow them to work with no need for electricity of other tools. Scents: Lavender, Fresh Linen and Tropical Coconut. If you're looking for another option when it comes to fragrances, why not consider one of our Gompels Concentrated Scents that can be diluted down and used for a range of varied tasks? They come in either a Citrus, Baby Powder or Rose scent and are ideal for all environments.